As Christians we are to live our lives by the principle of obedience. God has never intended that His children live in sin. However, Christians do sin, and many of them take sin all too lightly. In this lesson we want to deal with the question: What happens when a believer sins willfully? In Lesson 6 we saw one of the consequences of sin in a believer's life: Sin breaks our fellowship with God. In this lesson we are going to consider another consequence of sin in a believer's life: Sin can bring God's chastening hand upon us. Whatever sin we may have committed, if we go to God and confess that sin to Him and ask for forgiveness, we will be forgiven. Our fellowship with God can be restored very quickly. God is willing to forgive all the sins that we commit when we confess them sincerely. But that does not mean that we will not be chastened for our sins. 1. 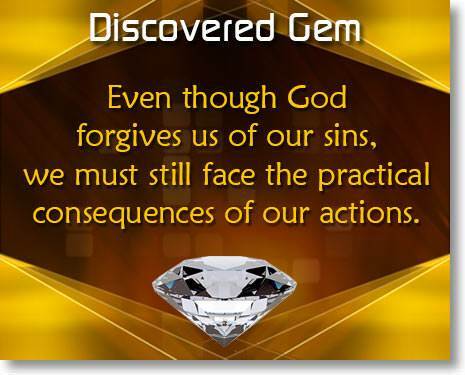 Although we may be forgiven of our sins, we must face the consequences of our actions. 2. Some sins have lifetime consequences. David was not only a mighty man of God but he was also the greatest king that the nation of Israel ever had. Even so, David sinned grievously and he suffered the consequences of his sins. 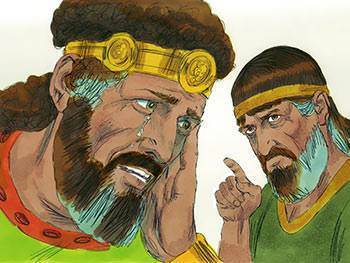 Chapter 11 of 2 Samuel records the account of David's great sin. David was at home in his palace while his soldiers were away fighting a battle. 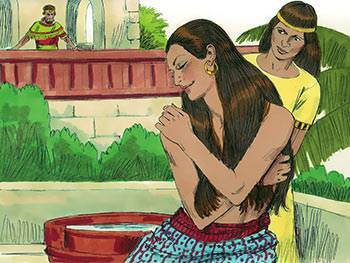 One evening as he walked on the balcony of his palace, David saw a beautiful woman bathing. Lust entered his heart. He sent for Bathsheba and committed adultery with her. Some time later Bathsheba sent word to David. informing him that she was with child by him. Since Bathsheba's husband, Uriah, had been away for some time, David realized that his sin of adultery would soon be exposed. "the thing David had done displeased the Lord." From this we can see that David was truly brokenhearted over his sins. God accepted David's confession, forgave him, and restored him to fellowship with Himself. Nathan told David, "The Lord has put away your sin: you shall not die." But this was not the end of the matter. God is the ruler of the universe and He is holy and righteous. 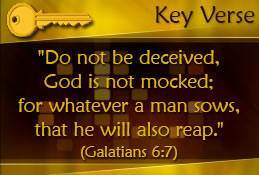 He cannot overlook our sins or pretend that He does not know about them. Although David was king, he nonetheless was chastened by God. The Bible says that God is "no respecter of persons." "The sword shall never depart from your house, because you have despised Me." Even though God had forgiven him of his sins, David had to reap the earthly and practical consequences of his wrongdoing. He suffered many sorrows. The son that was born to Bathsheba died. One of his sons was murdered. Another son led a rebellion against David and was killed in battle. Truly, the sword never departed from David's house. May we see that, though we may be forgiven of our sins, we, like David, must face the practical consequences of our actions. May we see also that sins often have lifetime consequences. A Christian simply cannot afford to live carelessly. He cannot afford to take sin lightly. Even though God is gracious, and willing to forgive us our sins, that does not mean that we will not be chastened by Him. We must not sin willfully. 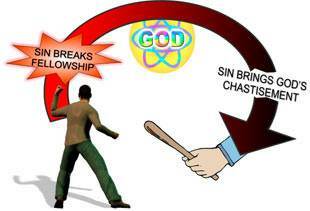 To deliberately disobey God is an act of rebellion, and it can bring God's chastening hand upon us. 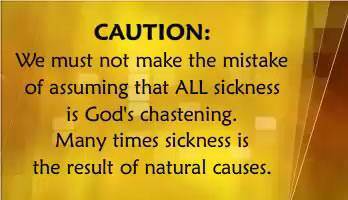 God does not chasten His children every time they do something wrong. He is not like that. He loves His children, and He is gentle and patient with them. David said, "He has not dealt with us according to our sins, nor punished us according to our iniquities. For as the heavens are high above the earth, so great is His mercy toward those who fear Him." (Psalm 103:10-11) David recognized that God is very gracious and exceedingly patient with His children. But there is another side to this matter. While recognizing that God is very patient and forbearing with us, we must also realize that a single act of willful disobedience can have serious and far-reaching consequences. It was a single act of disobedience on the part of the first man and woman that brought sin and death into this world, along with all the sorrow, heartache, and tragedy that results from sin. And a single act of disobedience on our part can have tragic and even lifetime consequences. A young man, the son of Christian parents, went to an immoral woman and had sexual relations with her. From this one-time sexual relationship, he contracted a venereal disease. He received medical attention, but the disease was not brought under control. In less than three years, he was dead. We must not live after the flesh. To live after the flesh is to give in to your fleshly desires and appetites. The Bible warns us against this. Samson is an example of the consequences of living after the flesh. 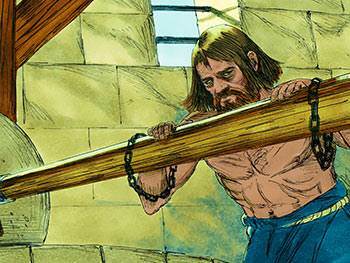 Samson was chosen of God to be a deliverer for his people. He was given special power and abilities by God. He performed many mighty deeds. But Samson did not control his fleshly desires. Samson had an immoral relationship with a Philistine woman named Delilah. 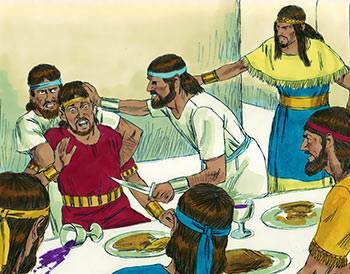 Delilah's actions made it plain that she intended to betray Samson into the hands of his enemies. Samson knew this. He also knew that he was doing wrong; yet he continued to have sexual relations with Delilah. No doubt God spoke to Samson's heart many times concerning his actions. Eventually, Delilah succeeded in her plan. She delivered Samson into the hands of his enemies. Samson thought that he could use his mighty power to overcome his enemies as he had done before. But the Lord had left him, and he was no stronger than any other man. The Philistines put out his eyes, bound him in chains, and put him in a prison house, grinding corn. We have listed some specific sins, but these are not the only sins that can bring God's chastening hand upon us. Any unconfessed and unforsaken sin can bring us under God's chastening. God chastens us that we might learn obedience. May we learn to agree with God quickly and to say to Him, "Lord, Your judgments are true and righteous. I am willing to be in subjection to You." God chastens us that we might be partakers of His holiness. God incorporates His holiness in us through His chastening. When He chastens me, I should say, "Lord, what is it that You are teaching me in this?" Each chastening should cause us to learn more of God's ways and to become more like Him. God chastens us that we might bring honor to His name. Through God's chastening and His discipline, David became a man after God's own heart. David's name is listed in the 11th chapter of Hebrews. 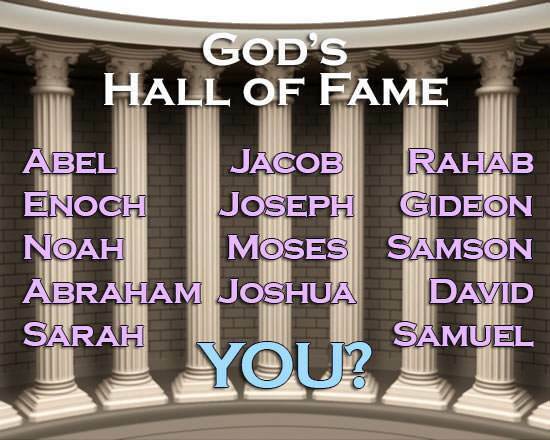 This is God's "Hall of Fame." It lists those who brought honor to God's name by their faith and by their deeds. Samson repented of his sins, and in his death he destroyed more of God's enemies than he did during his whole lifetime. Samson also is listed in God's "Hall of Fame." God disciplines and chastens us that we, too, might bring honor to His name. God chastens us that He may vindicate His name. "Lord, I gladly accept Your chastening in this matter. I acknowledge that this is due to my sin. I will gladly let Your people, the world, and Satan know that You had nothing to do with this, but it is all my fault." The more we submit ourselves to God's discipline and acknowledge that it was all our fault, the quicker God's discipline will pass away. On the other hand, the more we excuse ourselves and blame others the longer it will be with us. "Lord, I know that I was wrong. You are altogether right in what You are doing. What would I have been had You not dealt with me? I thank You and praise You for Your love and Your faithfulness to me."